Veneers can be used to give you a brand new, beautiful smile. If your teeth are chipped, stained, or just plain worn, porcelain dental veneers are a great way to reshape and brighten your smile! Smile enhancement can have dramatic results on your overall appearance. The smallest step can boost your confidence, self-esteem, and make you want to smile more. With modern advances in dentistry, cosmetic procedures can range from a basic color correction to replacing missing teeth, and everything in between. Fillings are one of the most common procedures that a dentist has to perform – and they’ve been done for thousands of years. Needless to say, dentists have improved the way we do fillings quite a bit over the centuries. Fillings have been used for thousands of years. Recent archaeological discoveries include beeswax fillings and stone drills, dating dentistry and fillings back almost 9,000 years. Just be glad you have sedation options now! You’ve probably heard that stereotype that the English have poor dental health. However, they were also the first to develop a way to attack tooth decay. Fillings were invented in Britain in 1819 by a chemist, Dr. Bell. These mercury based amalgam fillings also contained tin, copper, and silver. They started seeing widespread use by 1926 and made their way to America in the 1930s. After it was discovered that mercury wasn’t so good you, amalgam fillings morphed into other materials. Silver amalgam fillings, gold, and porcelain all saw extensive use in the 1900s. The most popular filling material now is composite, which blends into teeth well for a natural look. 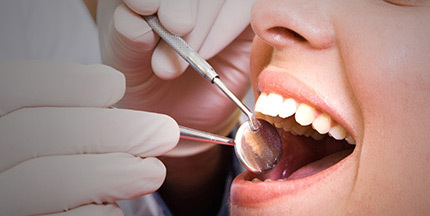 Composite fillings also preserve more of the natural tooth and last longer than other materials. Feeling thankful that you don’t live in the caveman days with stone drills? We certainly are! Contact us for more information about preventive dental care to keep cavities away! At the Burgess Center for Cosmetic Dentistry, we love what we do and are proud to offer a comprehensive list of cosmetic and general dental services to meet the needs of the whole family. Wisdom teeth are a third set of molars, and most people do get them. Some, though, end up not being able to grow them out properly because the teeth are blocked by other teeth and can’t come all the way through the gum line. This can cause distress because of the possible damage it can cause the teeth impacting (blocking) the growth, and because of the other problems, it can cause. Not sure if you’re fighting impacted wisdom teeth? Here are a few warning signs. Inflammation – Swelling in the jaw or gums, redness in the gums, and inflamed gums are all signs that you may have impacted wisdom teeth. You may notice more than one area that is inflamed. That is because you have wisdom teeth coming in on the top and on the bottom of both sides of the back of your tooth line. Tenderness and Bleeding Gums – Your gums may bleed because of being inflamed or because the wisdom teeth are irritating them. Bleeding gums may also be a sign of gum disease, and should be something you talk to your dentist about. Bad Breath or a Bad Taste – These symptoms may also be signs of other problems, but either way you should tell your dentist about it so he can get to the root of the problem. If you’re hitting the right age, and you haven’t yet had your wisdom teeth removed, keep an eye out for these symptoms as well as pain in the back of your mouth, headaches, or pressure anywhere in your mouth.